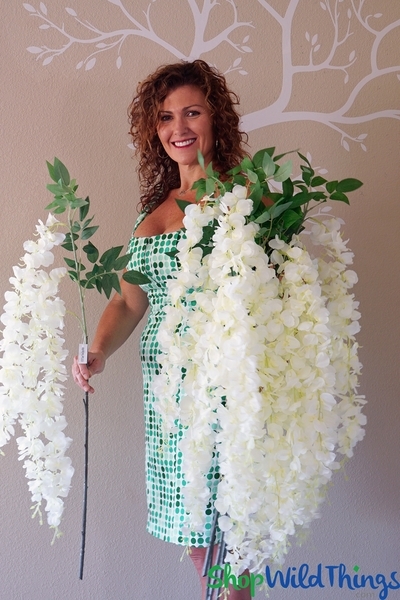 Our White Dangling Wisteria Floral Spray is perfect for creating a floral ceiling or for placing in floral centerpieces. 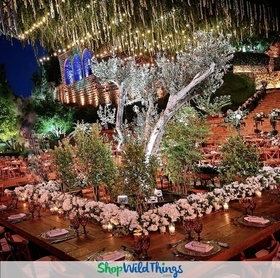 They are spectacular on their own or mixed with other florals and our popular crystal garlands. 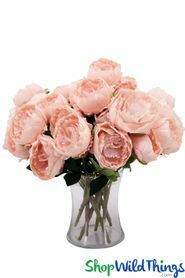 Our extensive line of faux silk flowers is a testament to our dedication of bringing joy and smiles to every bride, decorator and event planner while removing stressful decisions. From wondrous ceiling decor to gorgeous centerpieces to tall floor displays, our hanging silk florals can be used in so many ways and the delicate blooms are ideal for weddings, garden parties, beautifying events and freshening up home decor. In the demo photos showing Katie: there is one branch in her right hand and in her left hand are 6 pcs. You will get one branch that has three dangling lengths of flowers for every 1 of this item that you purchase. Please see the photo of the single item on the green grass. In the demo photo that shows the flowers in a vase: there are 6 pieces in one 24" tall vase. We all know flowers are an essential player in any wedding or event and they must look picture perfect all day long, regardless of rough handling or less than ideal temperatures and conditions. 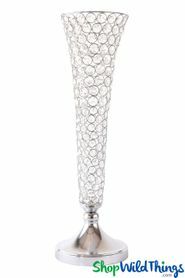 Our White Wisteria Floral Spray "Sukey" looks equally incredible sitting vertically in a Tall Vase, when used horizontally or even hanging straight down, giving you choices and the freedom to create floral designs as you see fit! The stem is sturdy but bendable, adding to your design options. 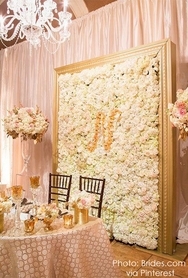 The blooms completely surround the flowing stems so this spray can be displayed at any angle! Completely vertical, the main stem is 24" long with an additional 14" of green leaf shoots. Three white wisteria stems hang down from the upper stem and each is approx. 3" wide. Each flowery stem hangs at a different level so the entire length of flowers (from top stem to bottom) is approx. 28"! When used horizontally, the flowering stems hang down 24" to 26" making it an awesome choice for adding some elegance to a pavilion, gazebo, trellis or shelves and tables. You can easily attach to Shepherds' Hooks or Wedding Arches to create a flowered aisle and backdrop or simply insert these graceful sprays into the holes on the top plate of Decorative Columns. These dangling sprays create an elegant, flowing look that's sophisticated and refreshing so why not immerse yourself and create overhead luxury by suspending from ceiling hooks or combine with crystal decor for a luxurious and impressive display. Exotic and blissful! Trouble-free and picture perfect all day!